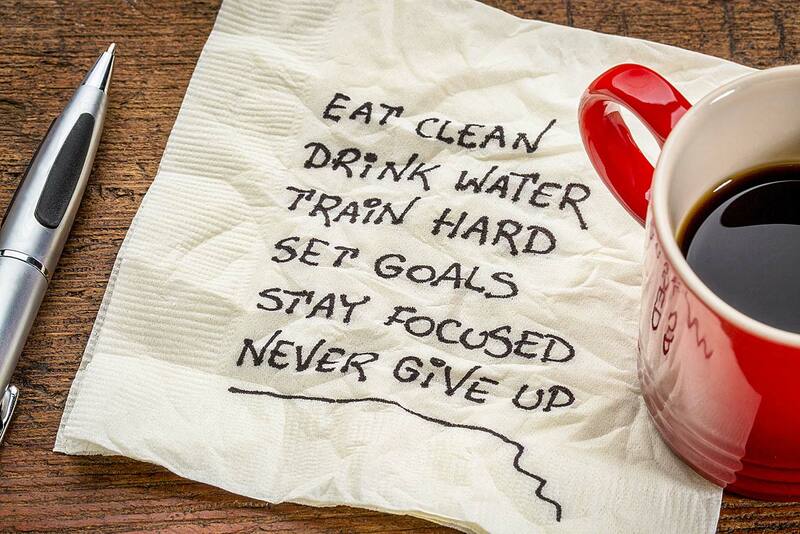 If you want to get serious about your healthy, there are a few “rules” to consider living by. These go beyond the mantras we utter about self-control, willpower, and dedication. Instead, these are a handful of helpful ways to organize your life and convince yourself every day that what you’re doing is important and, honestly, never-ending. When you hear that “it’s all in your head,” it’s pretty much true 99% of 99% of the time. You should shut out the “noise” of negative thinking that debilitates our minds and focus on the positive outcomes of your hard work. You must hone your inner motivation, and to do this you must be able to identify clearly WHY you’re living a healthy lifestyle. Is it to lose weight? Run longer distances? Lower blood sugar? Get off medications? It must be hyper-focused so you can feed off the inner motivation to achieve your personal goal(s). In order to succeed over the long-term, it will take true grit. If you cultivate grit, you will be able to commit to consistency day-in and day-out. Grit is how people wake up 90 minutes earlier than others to get through their workout, or eat a light lunch so they spend most of the hour exercising. You must be able to visualize yourself succeeding. Keeping the image of who you want to be can help you reach that person. Some trainers recommend visualizing the body you want and shopping for the clothes that will fit that body, and then try on those clothes every day until they fit. Less really is more when it comes to healthy eating. Too often we burden our willpower by giving ourselves choices between super healthy and not-so-healthy. Do we have pizza tonight or grilled salmon over lettuce? Well, you might make the right choice 3 out of 5 times, but if we don’t even give ourselves the “pizza” choice we increase our success rate and save our willpower for when we really need it, like when standing in the grocery checkout line, starving, and seeing those power/candy/snack bars (aka. sugary treats). Sometimes you need to take the detour. Life is full of obstacles that make living a perfect, healthy life really hard. There will be times you need to go out and have that nice date at that nice restaurant instead of eating a big salad and going to bed at 8 o’clock. Just enjoy the experience and get back to your “work” as soon as you can. Lastly, celebrate your successes. Praise yourself for your good work. Be happy when you hit your milestones and let your loved ones know that you’ve been achieving your goals. It will carry you through the plateaus. Have more ideas? Share them with us on our Facebook page.